Weddings - Bailey's Tree & Landscaping, Inc.
Bailey's Buds 'n Blooms specializes in weddings and special events. We can help you select the perfect floral arrangements for your special occasion and we also offer rental items for décor, linens and more. Each bride and every wedding is unique and we design every bridal floral customized to match the wedding style, needs, location, season and budget. Please contact Emily Bailey at 419-625-2352 or eabailey011@gmail.com for more information and an appointment to discuss all the details. 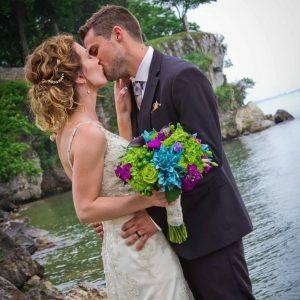 From this page you can explore our wedding photo galleries, find out what our clients have to say about us, view our rental items and pricing (coming soon! ), shop our linen rental selection and contact Emily Bailey for your wedding appointment. Please make sure you read through our Wedding & Floral FAQs to find out more details about our custom packages, deposits, service area and more. We do not offer fixed-price packages, but will design a custom floral plan for each unique event and budget. Made my wedding absolutely beautiful!! Very talented! Everything I've seen so far is beautiful! She's the only person I'd have do them for my wedding :))) Can't wait! Thank you! Emily did the flowers for our family for my mother's funeral. They were beautiful and captured exactly what we wanted. There were many comments on how outstanding they were. Thanks Emily for putting so much caring in such special flowers. Emily was great to work with and the flowers looked amazing. She helped to make our wedding special. We could not be happier with Bailey's Buds n Blooms and we would have no reservations about using Emily again or referring her to friends and family. Bailey's did a fabulous spray for my grandmothers casket. It was beyond anything we could have ever expected! Emily designed the flowers for my daughter's wedding, and they were absolutely gorgeous! The colors were vibrant and the flowers were very fresh. The guests at the wedding asked us who did the flowers because they were so beautiful. Emily was easy to work with and offered great suggestions. You'll enjoy working with her too! Absolutely beautiful!!!!! Emily does a fabulous job. Bailey’s Tree & Landscaping, Inc.
Bailey's is a family-owned and operated company, providing landscaping, lawn and tree services, fresh flower deliveries, custom wedding and funeral florals, a retail garden center, home décor shoppe and much more. © 2019 Baileys Tree & Landscaping, Inc. All rights reserved.